Polish Talmudist and mathematician; born at Buberki about 1700; died at Brody April 20, 1772. He was appointed one of the lecturers in the yeshibah of Zamosz, but at the same time he occupied himself with the study of secular sciences, particularly with mathematics, and while there wrote many notes on the "Yesod 'Olam" of Isaac Israeli and on the "Elim" of Joseph Delmedigo. During his residence at Zamosz he also wrote his "Arubbot ha-Shamayim" (still unpublished), a work on descriptive geometry and astronomy, in which many haggadot relating to cosmogony are explained, with a vindication of their accuracy. 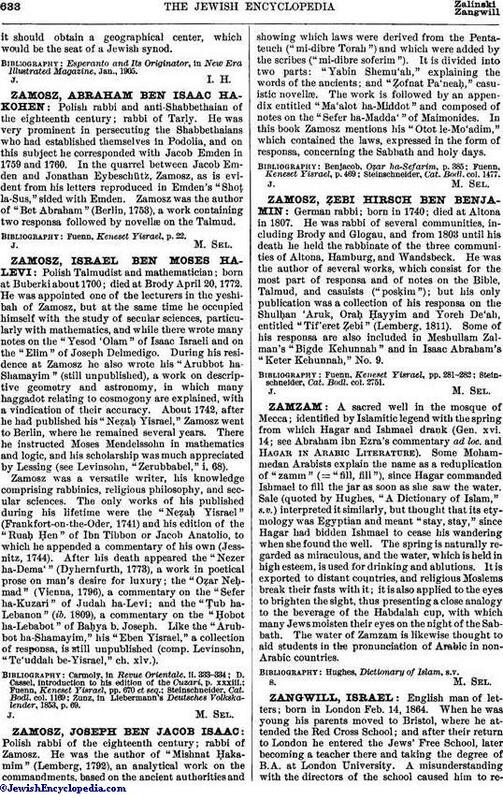 About 1742, after he had published his "Neẓaḥ Yisrael," Zamosz went to Berlin, where he remained several years. There he instructed Moses Mendelssohn in mathematics and logic, and his scholarship was much appreciated by Lessing (see Levinsohn, "Zerubbabel," i. 68). Zamosz was a versatile writer, his knowledge comprising rabbinics, religious philosophy, and secular sciences. The only works of his published during his lifetime were the "Neẓaḥ Yisrael" (Frankfort-on-the-Oder, 1741) and his edition of the "Ruaḥ Ḥen" of Ibn Tibbon or Jacob Anatolio, to which he appended a commentary of his own (Jessnitz, 1744). After his death appeared the "Nezer ha-Dema'" (Dyhernfurth, 1773), a work in poetical prose on man's desire for luxury; the "Oẓar Neḥmad" (Vienna, 1796), a commentary on the "Sefer ha-Kuzari" of Judah ha-Levi; and the "Ṭub ha-Lebanon" (ib. 1809), a commentary on the "Ḥobot ha-Lebabot" of Baḥya b. Joseph. Like the "Arubbot ha-Shamayim," his "Eben Yisrael," a collection of responsa, is still unpublished (comp. Levinsohn, "Te'uddah be-Yisrael," ch. xlv.). Zunz, in Liebermann's Deutsches Volkskalender, 1853, p. 69.